It’s that time of year again. A new school year is about to begin at school districts around the country. Chances are, superintendents, principals, and other school leaders have already returned from their short summer break to begin planning for the new year. Often, back to school huddle sessions among school leaders includes topics regarding new legislation and education policy, carry over or corrective action issues from the previous school year, and the renewed vision, mission, or direction the school needs to take to be successful for the school year that is on the horizon. Education represents a rare organizational sector that has a clean break from one year to the next. Organizations in the business sector have fiscal or calendar years, but there is no clear dividing line (like a 9-10 week break) that conspicuously demarcates one year from the next. School leaders are wise to view and use these new beginnings as people use the New Year on January 1st (except you should actually have a strategy to achieve the resolutions, goals, mission that are/is established for the new year). Below is a human resource perspective, with a few quick strategies, to allow school leaders to get the new school year off to a great start. Begin the year by establishing people principles that will have a lasting impact on teaching professionals and your school district’s future. 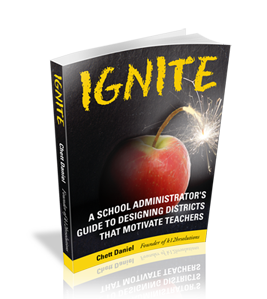 Motivating teachers and school leaders should be a top concern of any district. Research clearly shows that motivation has a directional component. Teachers and other education professionals need to be psychologically moved in directions that lead to desired school district outcomes. Motivation focuses attention on particular issues, people, and task elements and produces effort that allows people to become more engaged when they are motivated. Finally, motivation results in persistence. Schools need teachers, principals, and superintendents who are persistent and are committed to student and community success in periods of difficulty or pockets staff committed to inertia. So what do goals have to do with motivating teachers and school leaders? Motivation is goal directed. Goals are seen as the primary motor that propels attention and action. In addition, goal difficulty and personal importance are associated with motivational intensity and meaningfulness. If you want a great start to a new school year, establish challenging goals that are achievable and personally meaningful for yourself, the teachers in your buildings, and each member of your school district. While it is essential to establish goals to set the direction for teachers and school leaders, it is imperative they have the tools and resources need to achieve success. Research on employee engagement shows job demands positive and negative attributes. Demands require sustained effort, they deplete energy, and can result in strain, burnout. Job demands have positive attributes as well. When our minds and bodies face increased demands our engagement levels are heightened. Obviously your goal isn’t to burn out your teachers or principals. In order to minimize the negative effects of job demands that are naturally a part of challenging goals, and promote the positive effect of heightened engagement, school leaders must ensure job resources and personal resources exist or are available for teachers and education professionals. Job resources are the physical, social, and organizational aspects of the job that reduce perceived job demand and assist in achieving work goals. Examples of teacher job resources include, instructional resources, planning time, collaboration and mentoring opportunities, and perceived organizational support. 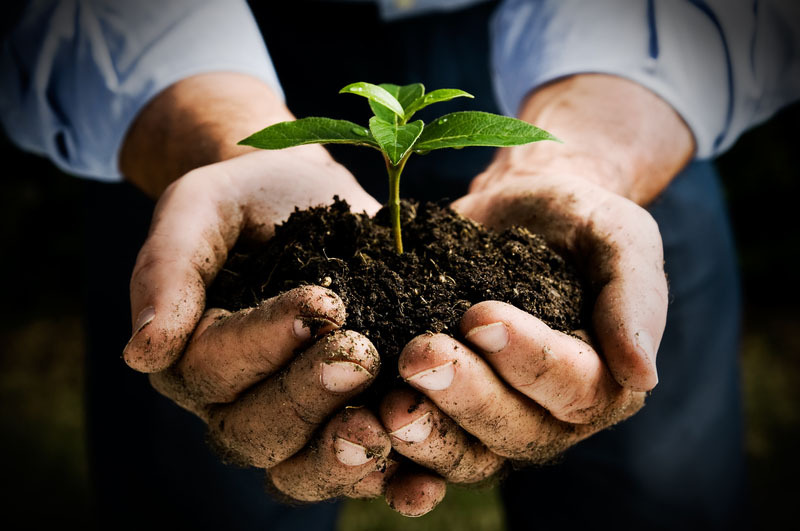 Personal resources, on the other hand, refer to an individuals’ sense of their ability to successfully control or have an impact on their environment. Factors that can have an impact on a teacher’s personal resources are feelings of efficacy, autonomy, skill variety, and feedback from colleagues and supervisors. When establishing goals for the new year, ensure adequate resources are available to achieve those goals. Quality professional development and mentoring programs will go a long way in building personal resources in teachers and principals that can help lead to goal attainment. Leaders must have an ability to influence groups of people toward the achievement of a vision or set of goals. A person may hold the title of principal or superintendent, but there is no guarantee they are perceived as a leader. Transactional leaders can rely on strong arming staff members towards change, but transformational leaders are more effective in bringing about long term change that does not result in a path of destruction. For a school to be effective, teachers and education professionals must be willing to follow those leading them. Following and relationship building with teachers begins with trust. Trust is predicated on three core areas: Integrity, Benevolence, and Ability. Integrity refers to honesty and truthfulness. For most followers the integrity of those leading them is a deal breaker and the litmus test of trustworthiness. Integrity also captures consistency of decisions and what is said vs. what is done, e.g. practice what you preach. Benevolence means the leader has your interests at heart and is genuinely concerned with both personal and professional aspects of your life, even if they aren’t completely aligned with theirs. This characteristic forms an emotional and personal bond between leader and follower. Ability captures the leader’s technical and interpersonal knowledge and skills to be effective in their position. The first two characteristics mentioned here are essential to build trust, but if followers don’t feel leaders have the technical chops needed to perform well, they are unlikely to trust and follow them. The upside of trust is worth the effort. When trust is developed employees are more willing to take risks, share information, engage in collaborative work, which will lead to increases in productivity. School leaders would do well to develop and hone these traits to foster trust in those who are expected to follow them to meet district goals. Also, consider activities and opportunities to encourage teachers to build and strengthen relationships between each other. To perform at their highest levels teachers and principals not only must trust those they work for, they must also trust those they work with. I know this sounds counter-intuitive and a recipe for emotional whiplash. Often the beginning of the school year brings about big changes in education and organizational policy. These changes are often unpopular and can be met with resistance from those who don’t like change. Research on organizational change has continuously shown that, to be effective, the actual change has to happen quickly. 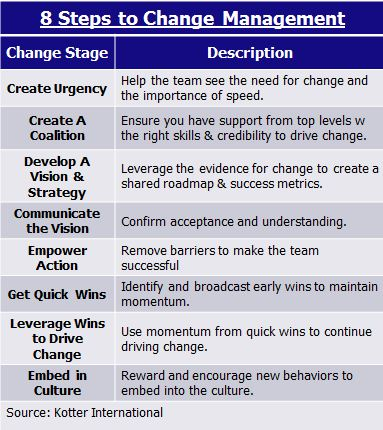 The organizations that build up to change and execute slowly perform poorer than those who quickly move through change. John Kotter, a professor at Harvard Business School, detailed an eight step plan for implementing organizational change. This was built on an earlier model by Kurt Lewin. Below is Kotter’s Eight Step Plan: Obviously you want to ensure that resources are available and the leadership team of the school district is willing to do whatever it takes to help during this time of transition and be sensitive to true road blocks that need to be resolved, but the key is not to drag out the change. A slow march to organizational change brings to mind the adage, “The fear and anticipation of death is worse than death itself.” (I don’t know that I would use this morbid reference in a staff meeting, but you get the idea). Eric concluded his article by challenging administrators to be instructional leaders and to take responsibility to observe and evaluate instruction where educators are utilizing a variety of technological resources. He also expressed the importance of allowing teachers the freedom to take risks and make mistakes. Principal Sheniger placed the responsibility on instructional leaders to posses the knowledge of effective practices and providing resources to make it happen. Conclusion School leaders have an enormous task of beginning each new school year. You are the engineers that ensure everyone’s on board as you get the locomotive started down the track, as well as the technician that lays the track to determine the direction of the train. Goals established by school leaders and their staff becomes the force that moves districts forward. It is an exciting and pivotal time of year for schools. We want to wish you the best in your coming school year. We deeply respect the responsibilities and role of school leaders as change agents in their communities. If you should ever require assistance, please do not hesitate to contact us. Thank you for all that you do for your students, staff, and community. (If you found the information in this post or any other article on this site useful, consider sharing this article on your favorite social media platform. You can also subscribe to this blog using the form at the bottom of the page or in the sidebar.